The race weekend really started on Thursday evening, when I drove to a mate's to borrow a generator. He had several to chose from, so I grabbed the one that apparently belongs to another mate. . Then we went for a curry. I was up at the proverbial on Saturday morning, and off to the circuit, thankfully pleasantly close to where I live nowadays (~40 miles). When I got there the paddock was *heaving* - I was later told that it was the only club race there all season. I eventually found a place to set up, and met up with mate Steve (who had helped me out at Castle Coombe). Prep to the bike had consisted of trying and failing to move the sharks fin to a more compliant position, and gerry-rigging the loom so that it would start in gear with the sidestand removed (something that had almost caused embarrassment at Castle Coombe). Tyres, oil, brake pads, etc were judged 'good enough'. Consequently, I wheeled the bike out of the van and into scrut'ing, and this time the scrute didn't even look at the sharks fin. Then the bike was on stands with warmers and the gennie chuggling away, I got my kit checked and signed on, and we had time for a bacon butty and cuppa tea before my practice session. While the skies were blue and promised a good day ahead, at that time in the morning it was *cold*. And the track was wet, and in no hurry to dry. My practice session was the last one, but it was still mostly wet, and I'd never been to Thruxton before. Contrary to what one might expect, I think it's difficult to learn a track in the wet. And my confidence wasn't helped by half the bikes in the session using wets, and therefore coming past me at a good lick. I was slow, but not the slowest, and the point of being there was to get a finish. As I kept telling myself. As per Castle Coombe, my two races were just about the last on the card - races 10 and 20. Race 10 was called late morning, and we filed out onto a now dry track. The warm up lap gave a hint as to how fast Thruxton was, but that was as nothing when the lights changed. Lord, it is FAST. I reckon Church Bend (http://www.thruxton.org.uk/img/thruxton_circuit_map.gif) must be the fastest corner on a UK short circuit - down one and fling it in. I glanced at the speedo on the slowdown lap and was doing 110mph thru there. Having a fast bike was an advantage, but I'd not really learnt any of the braking points in the wet practice, so the people I passed on the straights went back past me on the brakes. Mind you, there's only about 2 corners I was braking for - the rest I was just rolling it and changing down. Which was also part of the problem, obviously. Still, the 5 laps were soon done, and I'd got my finish, in a lowly 29th place (6 out of 9 in class), with a best lap of 1:33. There followed a long gap, with time for a leisurely lunch (amazingly I felt relaxed enough to eat something), and eventually, around 5pm, my second race was called. Now that I had my finish in the bag, and a better idea of where the track went, I hoped to enjoy myself a bit more, and so it turned out, carrying more speed everywhere, keeping the throttle pinned a bit longer, and actually overtaking people! This time I was 16th, (5 out of 9 in class), with a best lap of 1:31. Still not fast, as I'd need to find 4 more seconds to challenge for the podium, but it'd been a good day out all the same. So, 5 races towards the 6 I need for my Mountain Licence. I'd resigned myself to having to do the sixth in 2013, but for some reason I'd been thinking I had until the end of April to do it, and I've now been corrected that it's the end of March. There's not many meetings in March, so I'm slightly worried that one DNF could scupper my plans. So I might see what else is happening at the tail end of this season. Wonder if the Plum Pudding meeting still runs at Mallory? Hadn't been run for a year. I turned on the fuel, engaged choke, 3 tugs (ooh er) and it started. I'm still amazed when internal combustion engines do that. In the ongoing quest to get my 6 sigs for my TT licence, I was scouting through various clubs to see what meetings were on where and when, and noted that my alma mater North Glos (re-branded as NGRRC now, but they'll always be North Glos to me) had a meeting at Castle Coombe. Much better, they had a class called Streetstocks, for road legal bikes (for which you must have V5, MOT, number plate and even working horn). Having a road bike that used to be a race bike in the garage, this seemed ideal. I still needed a fairing with a catch tank in the fairing, so had to splash 200 quid on a fairing (see previous post), but otherwise it was simply a matter of lock-wiring the already drilled bolts. At this point I should admit that I have a poor record with race meetings and cold tyres, I crashed Caroline Sells 400 on the first lap of the first Jurby Endurance I did. I crashed the borrowed TZR on the first lap of practice at the TI-does-TZR-fest at Oulton. 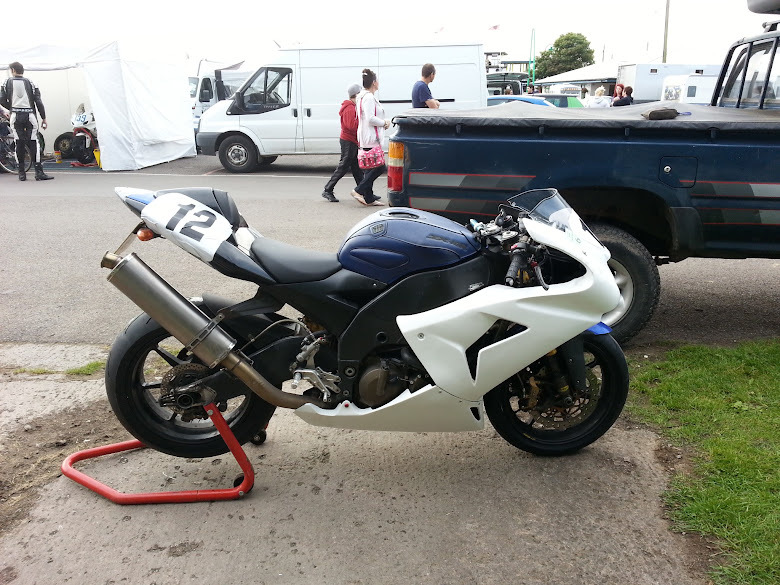 I've been ok at track days, and had had no issues at Ixie Cadwell a few weeks ago, so hoped I'd got over it. So, as I set off for practice, I had the mantra 'cold tyres, COLD TYRES!!!' running through my head. I accelerated hard in a straight line, then braked hard in a straight line, trying to generate some heat, then rolled gently into the first right hander. No problem. Feeling for grip, I wound it on for the exit, no problem. Arriving at the chicane, I repeated the safety first process, rolling gently into the right, and then rolling equally gently into the left...at which point the rear tyre oh-so-gently lowsided me off the bike. D'oh. The marshals were very friendly, letting me know that 'lots of people crash there'. I still felt an absolute prize numpty. No restarts after crashes are allowed, even in practice, so I had to wait til the end of the session and then ride the bike in, minus the RHS footrest. The bike took less than 10 mins to fix (new footrest, adjust clutch lever, bit of tape on the fairing), but I now had no practice, and I was damned sure I wasn't going to start the first race on this shiny new unscrubbed rubber. So I went straight off to A&R and bought some tyre warmers (145 quid, which was less than I expected), and borrowed some electricity from the chap next door, to give them a damn good cooking. To think I used to have 3 sets of tyre warmers, and I sold them all, thinking I'd retired :-). And then started the wait for my first race. And then there was a 9 race wait until my next outing. Isn't it odd that racing involves so much waiting around? Still, the sun was out, and there's many worse places to waste time than a race paddock. Eventually the last race of the day came round, and I knew I could enjoy myself a bit more this time. And I had an idea where the track went now too. Another good start, but this time I went with the front half of the field, and managed to run with them. Obviously things stretched a little over a couple of laps, but there were 3 guys just in front of me who seemed to not be getting away. Of course, I scared myself a couple of times, notably on the brakes into the first 'proper' corner (Quarry) where I had to throw out the anchors and the kitchen sink and brake all the way to the apex, but hey, I got round, so no problem. I caught the couple of guys in front and got past, which always make you feel better. 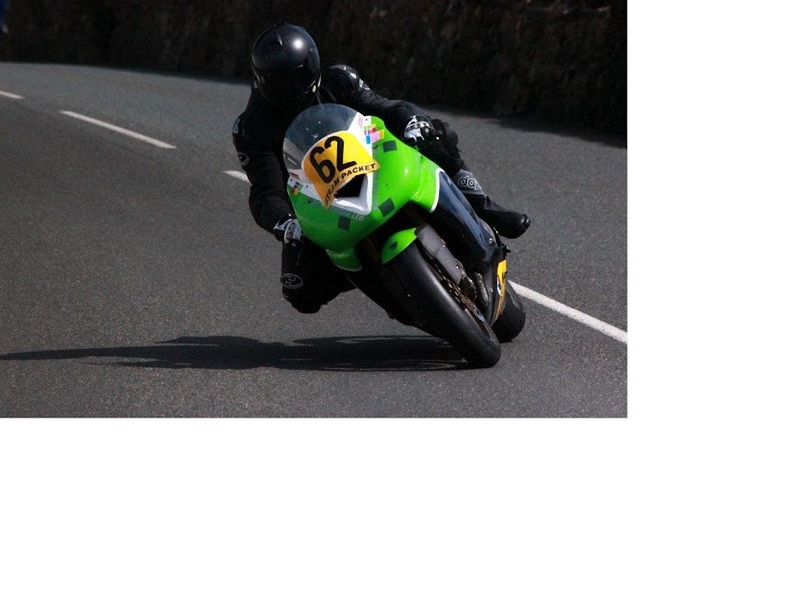 And, for me, the acid test, I was whooping inside my helmet as I passed the chequered flag. Mum! I'm on the telly! Not for long, it's fair to say, but that was me, racing my bike, on the television. 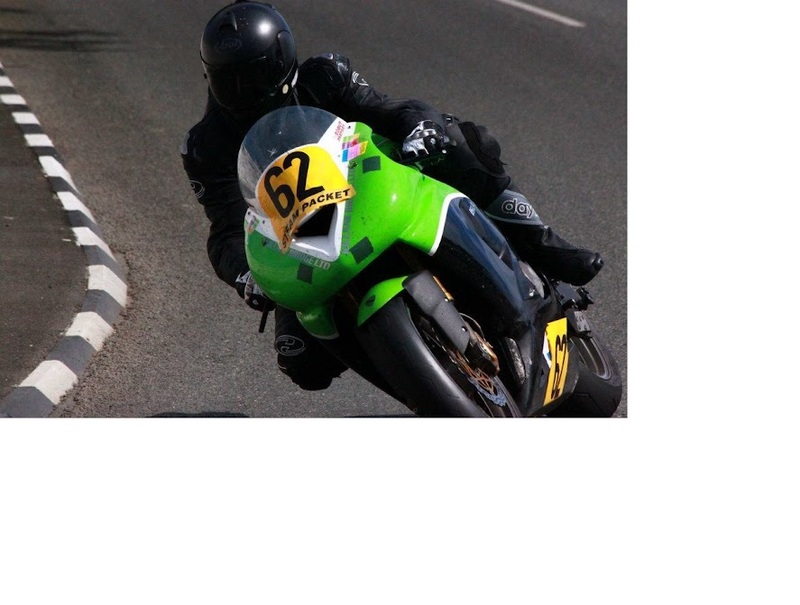 I'm #62, green Kawasaki and black leathers. Near the back. Not to be confused with Adam Jones' green Kawasaki, near the front. 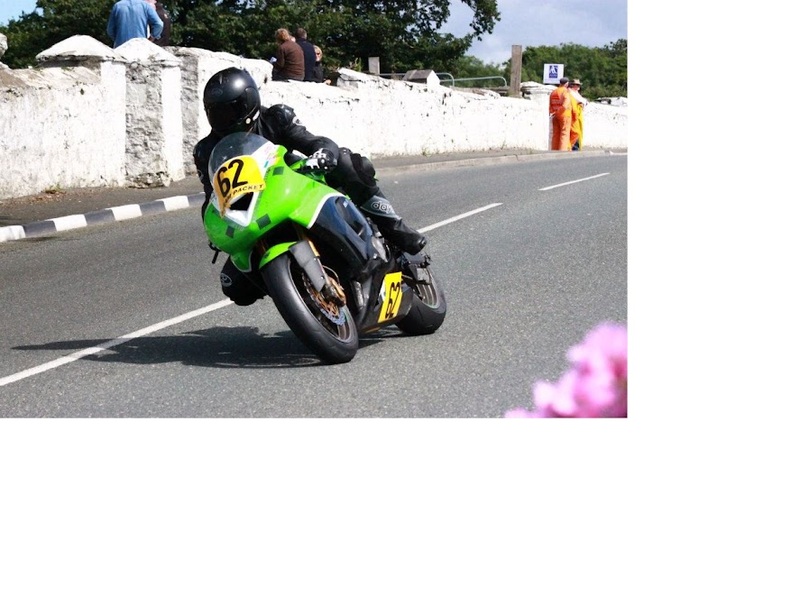 My best racing mate Keith McKay is #60 and in the same footage, and even harder to sport, as his bike is plain white, and he tends to take a "No, after you, old chap" attitude for the first lap or so, until the red mist descends.